Tony Hawk's Downhill Jam is a video game in the Tony Hawk series made by Toys For Bob and published by Activision as a launch title for Wii. 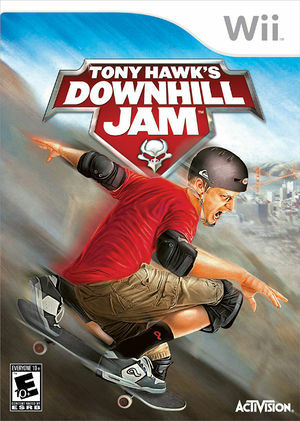 As a departure from Neversoft's Tony Hawk games, Downhill Jam emphasizes gaining speed and racing opponents, as well as competing for high scores and completing goals. Tricks can still be performed and there is a mode dedicated to high scores, but the main focus of the game is racing. The game is played with the Wii Remote in the horizontal position. Videos require "Safe Texture Cache" to render correctly. Otherwise they will show severe artifacts. Various static screens require "Skip EFB Access to CPU" disabled to display at all. Otherwise they will be a black screen. The graph below charts the compatibility with Tony Hawk's Downhill Jam since Dolphin's 2.0 release, listing revisions only where a compatibility change occurred.